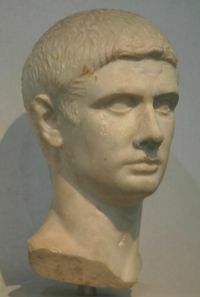 Marcus Junius Brutus was a Roman politician most famous for the assassination of Julius Caesar. He was the son of the Roman matron Servilia, and the nephew of the Roman statesman Cato the Younger. He was an early opponent of Caesar and a backer of the Roman general Pompey, but after Pompey's defeat at the Battle of Pharsalus, Caesar pardoned him and showed him favor. When a number of plotters came to believe that Caesar was acting like a tyrant and decided to kill him, they set out to win Brutus over to their side. Brutus was especially vulnerable to their appeals because he was descended from the founder of the Roman Republic, who founded the Republic by assassinating a tyrannical king. Caesar was assassinated on the Ides of March, 44 BC. In 42 BC, the forces of Octavian and Marc Antony defeated Brutus's army at the Battle of Phillipi. Brutus was killed during the battle. In Dante's Inferno, Brutus is placed in the 9th circle of hell which is the lowest level of hell reserved for the worst sins of all, traitors. He is being continuously chewed on by Satan for all eternity due to his assassination of Caesar. In Shakespeare's Julius Caesar the famous line "Et tu, brute?" (And you, Brutus?) was immortalised, though the actual final words of Caesar are not known for certain. The phrase had been used in previous works of other writers, but none maintain the audience or popularity of Shakespeare. This page was last modified on 11 July 2016, at 22:42.